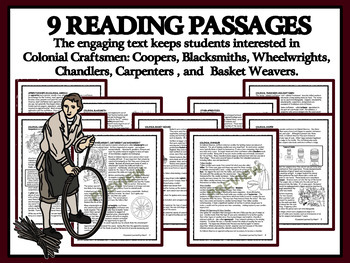 9 reading passages covering Colonial Apprenticeships, and six Colonial Craftsmen: Blacksmiths, Carpenters, Wheelwrights, Basket Weavers, Coopers, and Chandlers. Colonial Tradesmen and Craftsmen were the backbone of the American Colonies. Craftsmen were responsible for growing the colonies by building structures, making tools, crafting furniture, and creating goods and products that made everyday life possible. 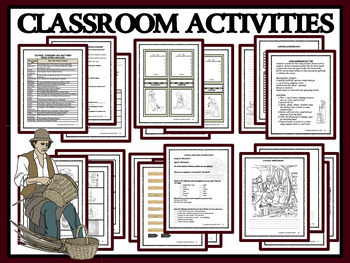 Classroom and enrichment activities keep students engaged as they learn. 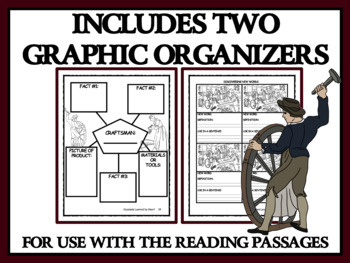 Great for use by substitute teachers, or for homeschooling or co-ops! Be a Carpenter - Make a Door! This lesson plan can be used with Group 1 or independently – activities in Group 2 are based on the six tradesmen in Group 2. The job application, worksheet, trading cards, bingo words, coloring pages, and match game cards in this product are each specific to Group 2. Check out Tradesmen and Craftsmen Group 1 for the following trades: Tanners, Tailors, Wigmakers, Gunsmiths, Printers, and Apothecaries. AVOID DUPLICATE PURCHASE: If you have purchased Colonial Craftsmen, Group 2 - Reading Passages and Comprehension Questions or Colonial Craftsmen, Group 2 - Reading Passages and Bingo, then you already own the nine pages of informational text that are part of this product. Additionally, this entire product is part of my bundled product: Colonial Craftsmen, Group 2 - BUNDLE. CHECK OUT MY OTHER HISTORY PRODUCTS!